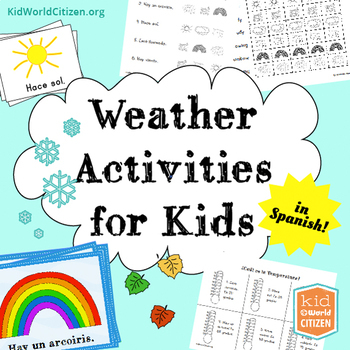 The Weather Activities for Kids packet IN SPANISH is a complete weather unit that includes reading, writing, math, and science activities to introduce vocabulary and concepts related to weather. Check out the preview to see the incredible illustrations- these exclusive, original drawings are adorable, and also appropriate for different age levels (for example, you can use this packet for ages 6-15 beginner Spanish students). 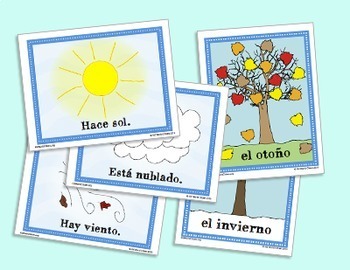 Students will trace the letters to complete the weather sentences, and color the pictures of the vocabulary. Then, students should cut apart the pages on the dotted lines and assemble their weather minibook. Students will match the vocabulary words on the left with the pictures on the right, drawing a line between the two. Students will draw pictures corresponding to the weather vocabulary. Students circle the correct weather picture. 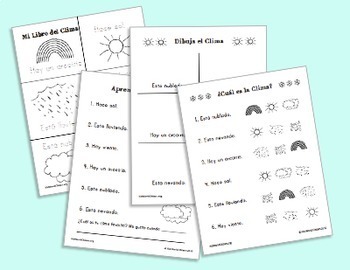 Each child gets a sheet of the pictures of weather vocabulary that they should color and cut out. As the teacher is reading the story, students will hold up the picture when they hear the teacher mention it in the reading. Students will read the simple sentences, and color the thermometer red, up to the correct temperature. Students will check the temperature every day for a week (Monday through Friday). They will also observe the record the weather, by cutting out and pasting 1-2 weather items in the empty boxes for that day. As a class, students will find out what everyone’s favorite seasons are and add them to the graph. Write the words that match the season in the correct boxes. Students will decorate the trees according to the weather and seasons. For example, for “fall” students will draw in colorful fall leaves on and off the tree. Using shaving cream and blue food coloring, students can create a rainstorm right before their eyes. 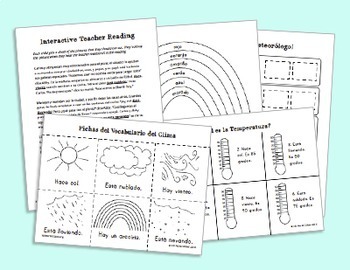 This activity helps students visualize and understand the water cycle. In this activity, students get to make a gauge that can be placed outside to measure the rain. Using an aluminum pan, a thumbtack, a pencil, a wool scarf, and a styrofoam plate, this activity creates static electricity, allowing students to experience lightning!